the Western Ghats, which bear the brunt of the monsoon rains, are blessed with an almost unbroken stretch of evergreen forest cover from the southern extremity of India up to the hills of Goa. The forests further north are smaller and gradually lose their evergreen character and become deciduous. In Maharashtra, for instance, evergreen forests are encountered in the Ghats only as small pockets in protected sites, and mostly as sacred groves. This change is linked to climatic conditions. The Ghats experience a dry season, the duration of which increases progressively northwards. In Kerala, the dry season is very short -- one-to-two months -- but exceeds seven months in Bombay. Coupled with this south-north gradient of a lengthening dry season are two other climatic gradients: one gradient relates to reduced rainfall as one moves away from the edge of the plateau or the peaks, and another, the gradual fall in temperature with increasing altitude. A tourist passing through the Western Ghats is likely to be fascinated by the height and the variety of the trees, the density of the foliage and its luxuriance and splendour -- and indeed take these for granted, believing them to be eternal and easy to regenerate. However, the villagers who live close to the forest, the forester who manages it and the research scholar who studies it know otherwise -- that this is only seemingly so; that these are among the most complex ecosystems on earth, and among the most fragile. The warm and moist climatic conditions necessary for dense evergreen forests also tend to impoverish the soil. A significant proportion of rainfall infiltrates the soil and gradually causes leaching of the elements which make the soil fertile. These soils (called ferralitic in the French classification of soils) are essentially composed of silica, bauxite and kaolinite clay. Their depth may extend to several tens of metres in some cases. The red soils of the Ghats are dotted with white patches of kaolinite. The hardening of the soil, in the form of lateritic caps (cuirass), constitutes yet another menace. In the deeper layers of the soil, the movement of the watertable brings about chemical reactions which ultimately result in the formation of the cuirass. Lateritic caps formed in the deeper soil layers, under forests, are today dug up -- with difficulty -- for use in construction work. It is obvious, then, why these forests are so fragile. They have taken centuries to extract from the poor soil the elements which have nourished their magnificent trees; but the roots do not go deep into the soil, exploiting only its surface layer. Only the topmost few centimetres of the soil are rich because of the humus formed by the decomposition of the forest litter. This magnificent forest, thus, lives on itself. When it is clear-felled, the surface horizons of the soil are rapidly carried away by the torrential monsoon rains, the steep slopes hastening the process. The chances of reinstating such dense forests on the poor soil that is left behind are not bright at all. The situation worsens when the erosion following deforestation exposes the cuirass. 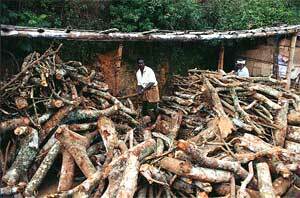 These, then, crop out and prevent natural regeneration of forests for centuries. Such cuirasses, now perched on the hills of the coastal zone of the Ghats are seen notably in the Dakshina Kannada district. There have been attempts to cover these with plantations of cashew-nut trees and Australian acacia. Elsewhere, in the regions extending from the foot of the Ghats to the sea, the dense evergreen forests have been replaced almost everywhere by a lower formation (deciduous forests) that is less dense and poorer in species. It is generally maintained in this state by continuous and rather high anthropic pressure. However, where strict protection is provided, some evergreen species make their appearance under the deciduous trees. These evergreen species are termed pioneers because they establish themselves under conditions of low humidity and restore a denser cover and a more moist forest ambience. Thus, they render conditions favourable for the return of the species characteristic of the dense forests -- provided such trees are still available in the region to provide their seeds for the reconstitution process. It is not easy to unveil the functioning mechanisms of the evergreen forest -- nor its structure. At first sight the forest appears to be homogenous, but a closer look reveals numerous variations. The forest crown, at 35-40 m, appears closed, domi nated here and there by giant emergent trees, sometimes 60 m tall. Below these the undergrowth may be thin, permitting easy circulation. A little distance away, the canopy comprises small trees, less than 20 m high, forming a dense cover. Elsewhere, there may be a gap open to the sky, allowing regeneration of young plants. Therefore, the forest may be taken as a mosaic of patches of different structures corresponding to the stages in the formation of the forest canopy. This mosaic is constantly changing. The death of a giant tree providing the top canopy may result in a spot opening up. Such openings make their appearance here and there regularly in a forest, and are considered by many to be the driving force of the forest's dynamism.Heterogeneity arises also because of local variations in soil topography and exposure. On steep slopes, where trees are more likely to fall, openings are more frequent and the crown less regular and shorter. In low-lying lands, because of constraints such as poor drainage and asphyxiating conditions, only a few species survive and become locally abundant. Others find conditions of humidity in the valleys favourable for their growth. Thus, different forest species have different 'temperaments' resulting from long-term selective evolution. Each one, through time, has developed a strategy for adapting to the habitat, and allowing it to compete successfully with other species. Each species occupies what is called a definite ecological niche. In fact, there is a continuum in the different strategies. The pioneer species germinate in the openings from seeds lying on the soil in large numbers, their dormancy broken by the new conditions provided by the openings created. These species have a rapid growth rate and are capable of reproducing early. They scatter their seeds, which in turn wait to find conditions suitable for germination. The pioneers are soon replaced by species that have come up in their shade and are now fighting for the light so necessary for their growth. Opposed to this strategy is the case of the large emergents. Their germination takes place in the shade, in the undergrowth of the forest, and their development takes place under conditions of high humidity. A strong exposure to the sun would prove fatal. Things change when they reach and cross the crown level. Their foliage is now exposed to intense insolation and to the desiccating winds. These trees as a rule produce big fruits containing considerable nutritive reserves but with short viability. Other strategies include under-storey species whose entire life cycle passes under the shade. These different strategies contribute to the well-being of the forest structure: a vertical structure with some species forming the upper storey, and a horizontal structure involving dominance of certain species, depending on local conditions. The species equally play different roles in the dynamic processes to assure renewal of the formation. Thus, species which play a similar or closely related role in the architecture of the population and functioning of the forest, may be classed together in 'functional groups'. This simplification is necessary to work out models of such functioning. Dense evergreen forests are characterised by significant inequality in the frequency of species. This phenomenon is particularly well marked in the Western Ghats, probably because of the somewhat peculiar conditions arising out of a distinct dry season. In the forests of Kadamakal (Kodagu district in Karantaka), for example, out of 100 tree species (of diameter above 10 cm) distributed over four ha, nearly two-thirds are represented by only one individual per ha. Many do not appear more than once in four ha. Contrarily, seven to eight species constitute 80 per cent of the forest growth. Most species must be considered rare or infrequent and most of the forest structure comprises of only a small number of species. This phenomenon is naturally very important for the conservation of species. Protection of small areas of the forest is insufficient for conserving its biodiversity in toto . Small areas, less than a hundred ha, for example, will contain too few individuals of most of the species to maintain their populations. The protected area will then include only the most frequent species -- only about a third of the initial diversity. What is interesting is that in spite of a marked dry season, which sometimes may last for over five months, the evergreen forests of the Ghats have a biomass and density comparable to those of most of the analogous forests of Africa, America and Asia. Malaysia and Indonesia, however, have forests with much larger trees and higher biomass. In the Western Ghats, the number of trees with diameter at breast height (dbh) of more than 10 cm vary from 600 to 650 per ha. The basal area (sum of the area of trunks at 1.30 m) ranges between 35 and 45 m 2 per ha, which is even slightly higher than the mean values obtained from the African and Amazonian forests. The published values have to be accepted with caution because, for correctly estimating these parameters, minimal areas of sampling are necessary. Counts carried out over too small an area may prove erroneous because of the presence of one or two large trees. The dry season has its major impact on the richness of species: the evergreen forests of the Ghats have fewer species than most analogous forests in the world. A count made over four ha in Kodagu revealed 97 trees with dbh of over 10 cm, whereas the number reported over a single ha in Africa and Amazonia is 120 to 150 and even 200 in Malaysia. This floristic richness is, moreover, irregularly distributed along the Western Ghats, correlating to the south-north gradient of a lengthening dry season. The forests of Kerala are richer in species than those of Uttara Kannada. But it is not in terms of the numbers of species that the forests of the Ghats are so interesting, but in terms of quality. As a matter of fact, following the marked climatic changes in the wake of the uplift of the Himalaya, the evergreen forests witnessed a shrinkage in their area, continuing to thrive only in the wettest zones. The evolution of the species in the forests of the Ghats has taken place in relative isolation, which has resulted in the appearance of endemic species not found anywhere else. Nearly two-thirds of the tree species in these forests are endemic to the region and confined to these hill ranges. Such a high rate of endemism is encountered only in islands or in regions isolated by geographic barriers or very harsh conditions of habitat. The distribution of the endemic species along the forest continuum of the Ghats is very clear. Some are found all through the continuum, others have scattered or a narrow range of distribution. There are variations in the area of distribution depending on altitude, climate and soil types. For conservation, it is important to establish the area of distribution of the endemic species in order to guide the selection of forests for protection. Certain regions contain forests much richer in endemics than others and should receive attention on priority basis. Besides their fundamental role in the protection of soils, water conservation of the monsoon rains and maintenance of the regional climatic balance, the forests of the Western Ghats constitute one of the most interesting models of the evergreen forest type of the world. Stretching over 1,600 km, they can only be compared to the forests of Madagascar and, to a lesser extent, to those of Queensland in Australia. The different climatic gradients bring about important variations which affect both the floristic composition as well as the structure and functioning of the forest, making the Western Ghats a privileged place for the understanding of the functional mechanism of this ecosystem. Finally, in view of their wealth of endemic species, these forests form a genetic reserve of fundamental importance that has to be preserved at all costs.